What an inspiring time I had on Saturday at the Constant Knitter (Dublin)! Maria Tapper was holding a Creative Embroidery course and the three hours were gone in a flash. She taught us 11 stitches which should give a good start to our embroidery lives. More than this: she shared with us some precious tips and let us flicker through her stock of embroidery books. I loved the relaxed atmosphere, the fact we could all pick whatever colour from the stock of cotton Maria had brought and learning so much in so little time. Above is the sampler I made during the course. You’ll see I have some relationship issue with the chain stitch. And yes: I still love running stitch a lot, like an unhealthy lot. At first I struggled a bit with the French knot (even considered applying for a patent for a new stitch: the French blob) but I am now plain in love with it. Did you notice my sampler misses the cross stitch? I was so late trying to sort my chain stitch I preferred to skip the cross stitch which was one of the few I already knew. Of course now I have half a dozen projects to add to my to-do list. I made an embroidered card on Sunday, and also started a series of cross stitch patterns found in a DMC book from 1969. 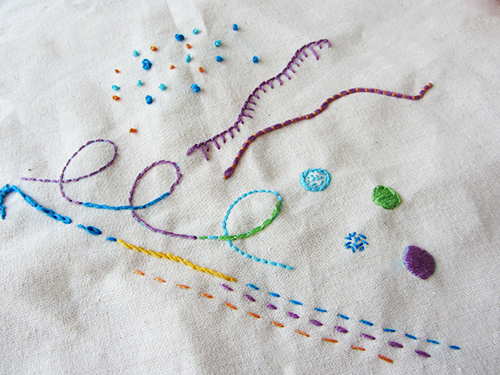 Plus all the lovely stuff I could make with French knots and stem stitches! But the upside is: one item to cross from my crafty year list!